I have a loft condo and I wanted to add a bit of bling to the living room and replaced the hanging light with this - just enough wow factor ! Easy to install , good price and nice bling! 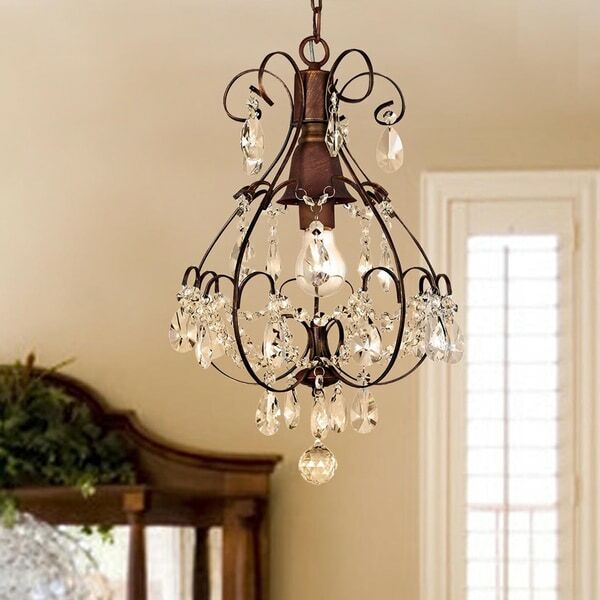 Add beauty to your entryway with this lovely teardrop crystal chandelier. Its brushed oak finish is sure to brighten up the decor of your dining room. This chandelier use 1-light that provides plenty of illumination. Suitable for the space of 108 sq. ft.
We just love this chandelier. We placed it in our dining room and it is perfect over our table. It offers glamour without being overdone. The crystals come in separate packaging and not attached. We attached the crystals after hanging the fixture. The directions offer some but little help in how or where to attach them. We simply opened all of the packaging and laid out all the crystals. You will find that you have both five strand (some with hanging loops on both ends and some with one hanging loop on one end) and six strand crystals, along with 1 major crystal and several teardrop crystals, as well as a number of two strand crystals (with a loop on each end). Look at the picture online and the directions and put on the crystals you are sure of first. Then, by process of elimination, you will be able to place the others. Obviously the very large crystal hangs on the very bottom. The five strand crystals (with a hanging loop on one end) hang around the lightbulb and dangle straight down. Then proceeding top to bottom. First, a teardrop hangs on each swirl at the top of the fixture. Next, hang the two strand crystals in the space between the two fixture loops and attach a teardrop to the center of each. *NOTE: When connecting one crystal to another always connect via a loop and not to the fixture itself. The next layer is the most complicated. Hang a teardrop crystal on every swirl loop remaining on the fixture. Then drape a five strand (with loops on both ends)between the open spaces (teardrop to teardrop) on the next layer. Last but not least, you will have six strand crystals remaining. They drape from the teardrop crystals with the five strand crystals that you attached in the last layer to the very bottom teardrop crystals (which circle the largest crystal at the bottom). Hope this somehow helps. You'll figure it out. We did. I absolutely love this chandelier. I purchased it for my back entry and it is perfect! It has a rustic elegance to it that I just love. Hanging the chandelier was not too much of a challenge, but putting on the crystals was not as easy. One of the problems I had was that I had too many of the 5 crystal strands with loops on BOTH ends. Once I figured that out, I just removed the loop on one end and proceeded to put those in the center around where the light bulb is. After that, I went by instructions written by another reviewer that I think explained it best on how to attach the remaining crystals. To give proper credit, it was written by mrsbam on Feb.28, 2012 (if you want to refer to the original review). I followed these instructions and didn't have any problems attaching the crystals: Look at the picture online and the directions and put on the crystals you are sure of first. Then, by process of elimination, you will be able to place the others. Obviously the very large crystal hangs on the very bottom. The five strand crystals (with a hanging loop on one end) hang around the light bulb and dangle straight down. Then proceeding top to bottom. First, a teardrop hangs on each swirl at the top of the fixture. Next, hang the two strand crystals in the space between the two fixture loops and attach a teardrop to the center of each. *NOTE: When connecting one crystal to another always connect via a loop and not to the fixture itself. The next layer is the most complicated. Hang a teardrop crystal on every swirl loop remaining on the fixture. Then drape a five strand (with loops on both ends)between the open spaces (teardrop to teardrop) on the next layer. Last but not least, you will have six strand crystals remaining. They drape from the teardrop crystals with the five strand crystals that you attached in the last layer to the very bottom teardrop crystals (which circle the largest crystal at the bottom). Once you get going, it all falls into place. Brushed oak is brownish but it could hardly be described exactly with its color. We installed it in our bath room in the location where it used to have a concealed celing light. We need a plate to cover the hole since the base plate of the lamp is not big enough. It is difficult to find one with exact color match. Potential buyers need to watch that. We ended up using a white one matching the ceiling color iinstead of the lamp itself. We also need to buy a clamping kit from Lowe to provide support for the lamp because we could not find a stud wood in the old hole. That is a *** dollar, a very heavy one and originally used to hang a fan. The crystal light weighs more than a ordinary lamp. This is overkill, but we do not have other good method to fix the lamp to a empty hole. With that clamping fixture, it was relatively easy to install. The crystal needs time and patience to hang expecially we installed the lamp first and had to stand on a stool to hang the crystals. But we expected using a little bit more time than doing it first and install. It adds elangance to the bath room. I love my chandelier. It's the perfect size for a dressing area; even a small one. Boy, it WAS crazy trying to figure out how to put it together! But I finally got it. Here's a tip: there are several areas where the crystal chains come together; Don't try to hook them all through the one drill hole. Put one ring through the hole and then hang the others off the ring that you've put through the drilled hole. Get it? Good luck! It was worth it. The chandelier is darling. I love the Teardrop Crystal Chandelier. They are more beautiful than I ever imagined. I purchased 3 and have used 2 above my kitchen island. I have gotten so many compliments on them. I appreciate all the others who have given reviews on this product and instructions on how to put it together. It was what convinced me to order this particular light and I couldn't be more pleased. Quality and beauty for the price....Unbelievable!! Very happy with this purchase. Hubby didn't want something too girly & this was the best choice because with the brushed oak finish, it wasn't shiney & too "blingy" . It's a great enchancer to the pewter blue & chocolate master bedroom. We love it! 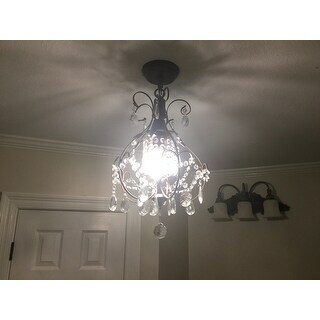 & I finally got my chandelier! 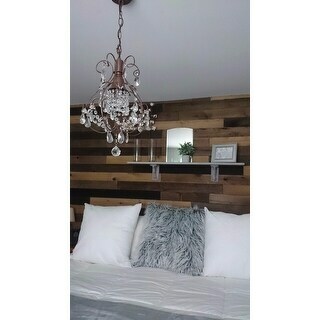 I intended to paint this chandelier black when I ordered it because I liked the style and design - just not the brushed oak color. It is now black and stunning with the crystals hanging from it. I wanted to put it in a newly renovated bathroom, and think it will be perfect. I ordered two of these from Overstock; one last year and one a week ago. The one I received last year is identical to the one in the picture and beautiful. The one I just received is a completely different color, it's a light brown, almost gold. The ring on top of the fixture that the chain clips too is round, not like the picture. It is obviously a cheaper copy of the original fixture. Not a bad fixture, just not the one in the picture. Disappointing. My husband put together the chandelier and installed it. The instructions are hard to follow because the author of them clearly uses English as a second language! :-) Beautiful and is just the right size and scale to go over the tub in the my master bath. Looks like I paid a lot more for this and love the unique shape. Perfect combination of rustic and glamor. 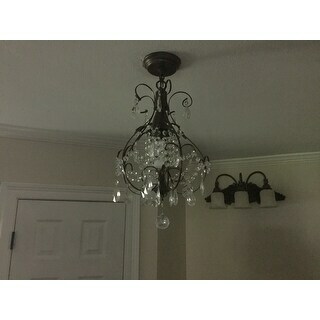 I absolutely love this chandelier, the come is perfect and is so pretty in my bedroom. Perfect size for the space and a perfect combination of rustic and glamor. A bit tricky to put the crystals on but once I figured it out it was easy. This is an adorable little light-fun to assemble-I have already put 3 other similar lights together so may have been getting good at it!! I want to put another one in my bedroom vanity area. Precious and well made-great price!! Such a cute piece for a small area in my Family room! Stunning! Very happy. Looks much more expensive. I used this for guest room, and it makes the whole room much nice . Highly recommended. Way too much crystals to put on (The actual eyedrop crystals I have a haze on it that make it look dirty)the instructions were terrible the actual lamp was twisted I have to do twisted back to somewhat to look normal. Beautiful and elegant. Makes a beautiful addition above my bathtub. It matches the decor perfectly and is very high quality. These lights were hung as part of a kitchen renovation. They look very expensive and were easy to hang. Beautiful chandelier — it’s perfect in my stairwell over this painting I purchased in Havana! I agree that the reviewer from feb 12th Saved our sanity with installation of the crystals . A two person job!! Lightbulb not included needs 50w something clear Love this!! Well here I am again thrilled with my purchase! Needed something shiny and pretty but not too heavy and this is it! I am always amazed I can have some off the wall decorating idea and have no problem finding just what I wanted or even something better. Keep up the great job reading my mind! Perfect purchase. Thanks from my now well lit, adorable little corner! I am so happy to have picked this chandelier for our entryway. The size is perfect (not too big, not too small) and the quality is great. Took a bit of effort to put together, but was definitely worth it in the end! Very beautiful. So happy with this light fixture. 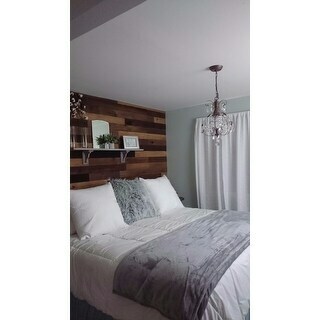 Lovely accent to bedroom. "Does this light product a good amount of lighting? I have poor lighting in my dining room I love this light but need a light that will produce a good amount of lighting." Yes, this light produce a good amount of lighting. No it's not very bright and it's very small for over a dining room table. "Can this be hung in Master Bathroom between tub and shower?? Thank you"
Yes, this can be hung in master bathroom between tub and shower.
" We need a longer chain because our Ceilings or 20 feet tall. Candace like come with a longer chain"
This chandelier came with a 39.4 inches chain. You can e-mail our Customer Care with your order number to purchase the extra chain. "I need to mount this very close to the ceiling since my two sons are 6'4" what does the mounting plate look like and can the chain be shortened?" The mounting plate is a black round plate. The chain can be shortened. "Where in the world do the crystals go. I’ve looked at the photo since there are no instructions but I’m baffled. There were no numbers on the packages of crystals and there are 9 different size and shape crystals? HELP! Photos anyone?" What I did was lay out all the same sized strands. That way you can determine the ones that hang around the bulb. (Strands with 5 crystals). The strands with the six crystals then attach around the outside. I hope that helps. We are in the process of adding the instructions on the page. "Looks like the center has a bare bulb? Is the light harsh or glaring when you look directly at it?" Yes, the center has a bare bulb. No, the light is not harsh or glaring when you look directly at it. My sister assembled the crystals for me & she hung crystals on hooks around the bulb so it was not bare. I prefer the bare bulb look but you can arrange the crystals in a way that you prefer as there are plenty. It is a beautiful, unique light. Works perfectly in the large bathroom of our 100 yr old bungalow. "The description says the chain is 39.4 feet. Should it be 39.4 inches?" Yes, it should be 39.4 inches.